provide easily accessible drinking water to their staff. 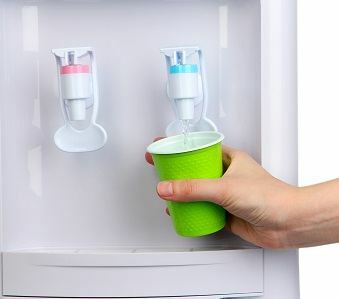 A 1992 UK Workplace Regulation stipulates that “an adequate supply of wholesome drinking water shall be provided for all persons… in the workplace" and that employers must also "provide a sufficient number of suitable cups”. The cups requirement is waived if drinking water is provided by a fountain. In addition UK employers are required to provide an accessible area for staff to sit and eat, as well as facilities for making hot beverages and warming food. Drinking water that employers provide must be free from contamination, and the Health and Safety Executive (HSE), a consumer advocate and workplace regulatory watchdog, states that water should be sourced from the public water supply but that bottled water dispensers are acceptable as a secondary source. If water is sourced from a bottled water cooler rather than from the mains water supply employers must ensure that there are adequate supplies, taking into consideration the temperature of the working environment and types of work activity. Fortunately it is not difficult to comply with these rules because several reputable water cooler providers offer a range of bottled coolers and plumbed-in dispensers to all corners of the UK market. Choosing the most suitable source of water for your place of business is simply a matter of deciding between bottled water and mains-fed water. Beyond that the quality of service and maintenance will also influence your choice.